I have a double bass (two separate bass drums). Both have Pearl P930 longboards. My problem I'm trying to troubleshoot is that I get a very quick slap-back note. I make my intended primary kick note and the beater just wants to immediately go back at about a 32nd note speed for a quiet, but noticeable second hit. I haven't had this problem on other drumsets but those have different pedals. I've tested by putting an old-school felt, round beater on and that's helped about 80%. However, that immediate followup strike still happens. Between troubleshooting my technique and feeling a bit lost on possible pedal adjustments I'm reaching out for guidance. The "feeling" I get is that the standard beater on the 930 is just too light. It's so light that followup strike is almost a buzz... it's very quick. The heavier, old-school beater helps that along. Any suggestions to reduce this for how to treat pedal tension adjustments, batter head best-practices, etc.? I've had this problem with silent stroke heads as these mesh heads give quite a lot of rebound. Obviously in your case, this isn't the issue. What it could be though is that you've got the pedal spring done up pretty taught, try slackening off the spring and see what difference that makes. I use to have my spring done tight, but now I've slackened it right off and the rest position of the beater is quite far back. Seems to work a lot better for me now - the beater now gets "catapulted" into the drum head. YMMV. Dude, it's like you read my mind. I'm currently trying to resolve this very same issue with my P930s. My batter head is not that tight. I read on one board that having a port hole on the reso (one person actually put on the batter to the right of the strike pad!) resolves this issue. I don't currently have one because I like the big resonant boom I got going on. So I'd hate to compromise that in any way. Looking for solutions!!!!! I bought a second kit recently and was having the same problem. My first thought was to increase the spring tension. It helped a little, but I was noticing a slight second slap like you mention. I’m not one to burry the beater into the bass drum head. I tried raising the footboard and it may have helped slightly. Finally, I realized that I was sitting lower on my new kit and possibly the problem was my leg angle. I raised my throne a bit and my problem was solved. It wasn’t my equipment, it was me. Check out this thread on the topic of port v. no-port on the bass reso. Prof.Sound provides some incredible analysis here. The bounce-back effect of no port and the solution if you don't want to sacrifice BASS sound for better action on beater rebound. I think I may try the small holes around the perimeter of my reso. So, another possibility is that my un-ported heads are letting the air produce push-back? As for seating angle... good idea, although I'll admit I'm reluctant to change just because I feel like I have a sweet-spot for my own comfort, but I'll give it a try this evening. Thanks everyone! Last edited by DrumPlayerFTW; 02-01-2019 at 05:33 PM. 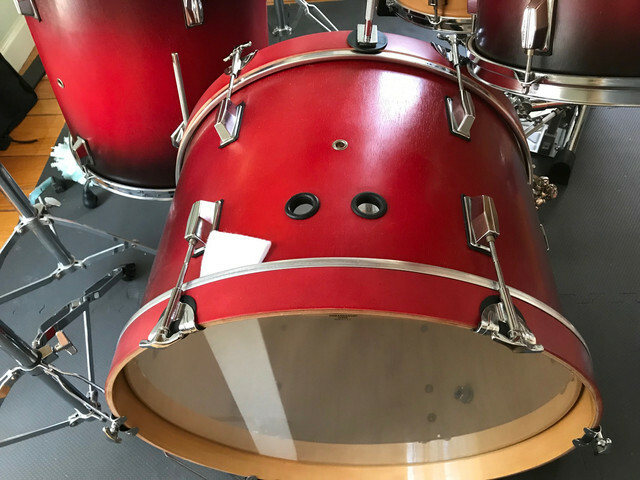 I initially put these chrome covers (faucet blank outs from Home Depot ) on the bass after I refinished the kit and removed the tom mount from that spot. Again no port on the reso head. I removed those and inserted some rubber grommets (fit perfectly). BIG DIFFERENCE! I think I can live with the small amount of bounceback happening now. I've already gotten used to it. Interesting, so basically your sense is that it was air pressure pushing back on the batter head that needed to be released? Yeah that’s what I read in several different threads as a likely culprit of the bounce back for folks who don’t port their reso head. I can attest that providing those two 1inch holes up top greatly reduced the issue. I had a sense that it would help because when I pressed the beater into the batter head (using my hand) I could feel air being forced out of that little hole you see up top with the metal grommet. Great guidance everyone - thank you all very much! I may port one of my bass heads as soon as I get a bit of time... I suspect it may get me most of the the way there with this issue.